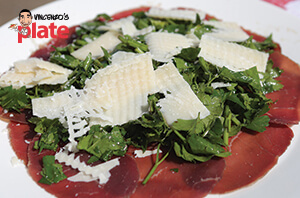 This refreshing Bresaola Salad fuses together everything you love about an antipasto dish! Mixing together a lean cold meat along with fresh parsley, lemon and parmesan flakes, you are bound to fall in love with this light and easy creation that will leave mouths watering. 1. Wash the parsley well and then chop into small pieces (If you are using arugula just leave it whole). 2. Pour 4-5 tablespoons of extra virgin olive oil into a jar and the same amount of balsamic vinegar. 3. Squeeze the juice of half a lemon into the jar, put the lid on and shake it together really well. 4. Put the parsley into the mixing bowl and add the dressing, mixing it together with your hands. 5. Get a flat, round plate (or chopping board) and start layering the Bresaola in a circle on the outer part of the plate. 6. Add another layer and then another, until there are no white gaps. 7. Using your hands, sprinkle some of the parsley mix over the top, creating a small heap in the centre. 8. Grate some Parmigiano Reggiano flakes over the top, making them uneven and letting the crumbs fall onto the salad too. 9. Squeeze more fresh lemon over the top, being careful not to let the seeds fall in! 10. If you want to add another layer of richness, drizzle some balsamic glaze over the top of the Bresaola Salad. Not only will it make the dish even more colourful, it will give it an even bolder flavour.